NORWAY: Higher power and tradable electricity certificate prices boosted Statkraft's gross revenue from wind grew to NOK 322 million (€34 million) in Q3. Underlying earnings before interest and tax (Ebit) of NOK 99 million was up from a NOK 287 million loss in the same period a year ago. The Norwegian energy group’s NOK 322 million gross revenue from wind power in the third quarter, meanwhile, was up 163% year-on-year. Statkraft stated the increase in underlying Ebit was due to higher power and electriciry certificate prices, plus an increase in generation. The state-owned energy company sold 0.5TWh from its wind power assets in the third quarter, up from 0.4TWh in the same period one year earlier. In its second quarter financial report, released in July, Statkraft said it plans to ramp up wind and solar development. In September, it announced plans to invest around NOK 10 billion in renewables each year between 2019 and 2025. Accordingly, in the third quarter, it invested NOK 596 million in new wind capacity — nearly a six-fold increase on the NOK 96 million outlay in Q3 2017. The company added these investments were mainly related to the 1,056MW Fosen Vind complex in Norway, in which it owns a majority stake (52.1%). The 256MW Roan project, a 71-turbine site, is the first of six that will make up the Fosen cluster. All turbines have now been connected to the grid, Statkraft said. Overall, Statkraft recorded an underlying Ebit of NOK 2.7 billion for the third quarter, up 115% from the NOK 1.24 billion in the same period last year. It stated that this increase was "driven by higher Nordic power prices and was partly offset by negative effects from energy contracts". Christian Rynning-Tønnesen, CEO, said that Statkraft’s "strong underlying result and cash flow from operations" provided the company with a "robust foundation" for its planned growth in renewable energy. 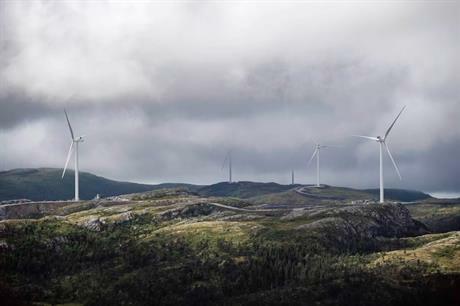 The 0.5TWh produced by wind accounts for 3.8% of Statkraft's 13.1TWh total output in the third quarter, which was down from 13.5TWh in 2017. Hydropower output accounted for 12TWh of total generation, gas power produced 0.5TWh, while 0.1TWh was attributed to district heating and to ‘other power’. Statkraft's compatriot Equinor also published its Q3 financial report. It saw adjusted earnings in the quarter more than double from $2.35 billion (€2.06 billion) to $4.84 billion (€4.24 billion). It did not report seperately how its wind business, under the New Energy Solutions unit, performed.